Twin is not just Allen Shawn’s story. It serves as a guideline for any person who faces a succession of losses in his life. This is the leitmotif of a touching memoir written by a man who “lost” his twin sister when his parents gave up the battle of caring for her at home . Allen’s twin, Mary, disappeared from his daily life at age eight—first to “camp,” then to an institution. “. . . the event left a kind of ocean of disquiet in me. . . .“ Life continued and parents said little to siblings Allen and older brother, Wallace, about the decision. In the “griefs” mentioned above, Shawn includes Mary’s departure, the death of a teacher, his witnessing another death on the street, and protecting a little girl from sexual assault. Soon after, nightmares and other symptoms began to arise. He attributes his own difficulty with panic attacks and agoraphobia to the issues surrounding Mary’s disappearance (was this really cause and effect, or were other genetic tendencies manifesting here?). Shawn devotes an entire chapter to the subject of autism, which was Mary’s eventual diagnosis. It is evident that he searched the literature, including works of early pioneers—Uta Frith and Bruno Bettleheim—as well as extensive interviews with current practitioners. In most chapters, Shawn vividly describes Mary’s behavior—illustrative in itself of the disorder. “She needs others, sees them, and takes delight in them, but they exist only as they are in relation to herself.” This chapter is very informative, but there is so much more. The issue of “twinship” complicates a matter that would be difficult for siblings in any family. Shawn shared a special bond with Wallace, but an even stronger one with his twin, Mary. Like an infant in a bilingual home, Shawn learned two languages: one unspoken, for Mary; and the other for everyone else. Descriptions of their early childhood activities—puppet shows, musical performances, and normal childhood interactions—are touching. His mother sought to shield both sons from Mary’s behavior, but especially Allen, the normal twin, by continually encouraging him to think of himself as an individual. Shawn’s parents upheld a fragile embrace that encircled the family. There were elaborately planned visits to Mary’s “School,” after which both parents tried to reassure themselves that she was indeed doing better and perhaps “happier than the rest of us.” Still, each suffered in his or her own way, sheltering one another and bearing private burdens. The writing is clear and heartfelt. The book follows Shawn’s first work that describes his struggles with agoraphobia. 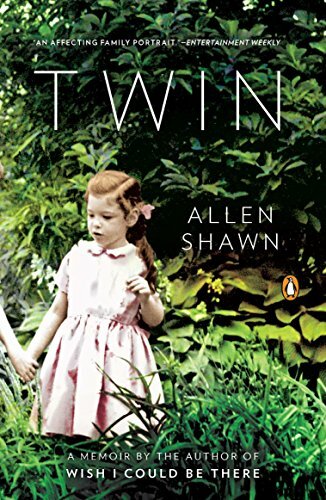 Twin: A Memoir—a kind of sequel—focuses on his connection with his sister and recognizes many similarities in their basic natures. For a subject of such heartbreaking import, it is also a story of triumph. Again, it is not just one man’s memoir. For some readers, it might serve to explain their own reaction to the behavior of a loved one with disabilities; for others, it might ease the difficulty of dealing with a family member struggling with post-war combat trauma or early adult psychosis. Any person seeking understanding and resolution of his own feelings of loss—regardless of its source—will benefit from reading this work.